I love baked beans with English breakfast, on toast or on baked potato. 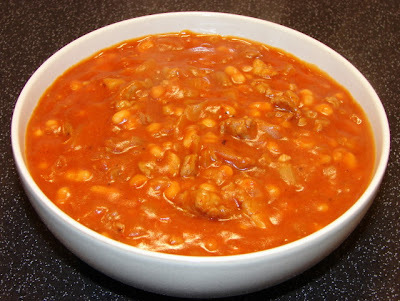 Ever had stir fried baked beans? Since I was a kid I adored baked beans with pork ala Chinese style. I think many Chinese kids brought up in the far east are familiar with this. It's cheap and tasty, perfect comfort food with rice. Dice pork into small pieces. Marinate with a little soy, pinch of pepper and cornflour for 10 minutes. Heat wok with a little oil, fry garlic and onion till softened and fragrant. Add pork and stir fry till pork is browned. Add baked beans. Seasoned with enough ketchup, oyster sauce and chilli sauce to taste. If you like a sweeter taste add some sugar. Add some water to the make the sauce to the thickness you like. Heat till hot and bubbly. Chicken also works well with this recipe. Can replace pork with spam too and omit marinade. Can also add some fresh tomato pieces to bulk up the dish. Hi Lizzie, surprise you did not have this when you were a kid in HK. Try it you will love it. Gonna make this tonight because it's so cold outside. Been a big fan of your site for a long time btw. Keep it up!